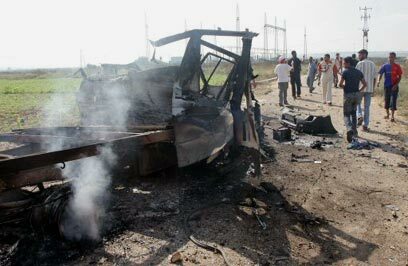 An Israel Defense Forces' investigation into a major terror attack thwarted Monday morning south of the Karni crossing in the Gaza Strip revealed that the gunmen, believed to be affiliated with al-Qaeda, arrived at the crossing with several trucks and at least five horses loaded with explosive devices and mines. According to the army, it is possible that the gunmen had planned to kidnap a soldier. About 10 to 12 terrorists took the horses off the truck and began planting the devices near the fence. At this stage, they were spotted by an IDF force and began firing at soldiers from Golani's 13th Regiment. The troops fired back, and the terrorists tried to escape and return the horses into the truck. At least four gunmen were killed in the battle. The force chose not to enter the Strip for fear of an abduction trap, and the army sent warplanes and tanks to the area instead. Meanwhile, the IDF continues to investigate the foiled terror attack. The initial probe revealed that the cell had prepared for the attack for a long time. A senior military source told Ynet that complicated and combined attack had been thwarted and that it was safe to assume that the terrorists had planned a kidnapping as well. The cell's goal was undoubtedly to target soldiers near the border fence. 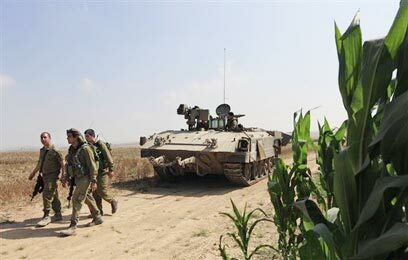 The terrorists were first spotted some hundreds of meters from the border fence, after opening fire at a Golani force on the Israeli side of the border. Immediately after the first shots were fired, additional IDF forces were dispatched to the area and fired massively at the cell. At this stage, some of the cell members began escaping on cars and a truck, which they may have been planning to use for the abduction. Mortar sells were fired from the Palestinian territory in order to help some of the terrorists to escape. This activity points to the fact that another cell was engaged in covering for the cell. The goal may have been to attract some of the forces into the Strip or set a trap for them should they enter the Palestinian territory. IDF sources noted that the investigation into the incident was still at its early stages, but that it was already clear that the soldiers' activity – as well as the warplanes and tanks which fired at the cars the terrorists escaped in – helped foil a well-planned terror attack. Defense Minister Ehud Barak praised the soldiers' activity on Monday afternoon. Speaking at a Labor faction meeting, Barak said that "in an operational, purposeful and efficient activity the IDF thwarted an operation aimed at carrying out a major attack on the fence… The results speak for themselves and testify to the alertness of the forces along the Gaza border." See all talkbacks "Gaza gunmen use booby-trapped horses against IDF"